Open your home to the fresh Spring air without opening your home to unwanted pests for less than $200, including free UPS ground shipping to the lower 48 states, with our Plissé invisible screen. Invisible screens allow you to open your home whenever you want to save energy and then hide them neatly away when you don’t need them! Plissé invisible screens by Screen Solutions are perfect for French Doors, Double Doors, In-Swing Doors, Out-Swing Doors, Patio Doors, Sliding Doors and Windows, too! 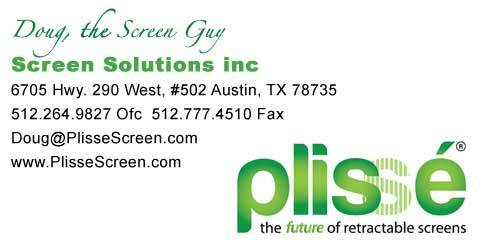 The latest in European styling, the Screen Solutions Plissé (pronounced plee-say) is the newest and most innovative invisble screen design currently available. Here at Screen Solutions inc we offer this superior product with simple to follow instructions that make it easy to install yourself in as little as half an hour and for under $200, including shipping. Click to Hear How to Say "Plisse"
The Screen Guy Blog is a helpful resource for all of your screening needs from pictures of different installations, adapters and uses to informative articles on a variety of topics such as ‘invisble screens and pets’, ‘your children and an invisble screen’, ‘how to invisibly screen in a porch with retractable screens’ and much, much more. We’re here to help you solve your every invisble screen door need so please don’t hesitate to give us a call or shoot us an email if you have a question.